Home › Credit Report › What Is A Fair Credit Score? Most lenders rely on FICO® Scores to assess your creditworthiness so, if you want to avoid paying too much when borrowing money, you should know how you are rated. Lenders are more likely to categorize you as a high risk borrower and charge you higher interest rates on loans when your FICO® Score is low. 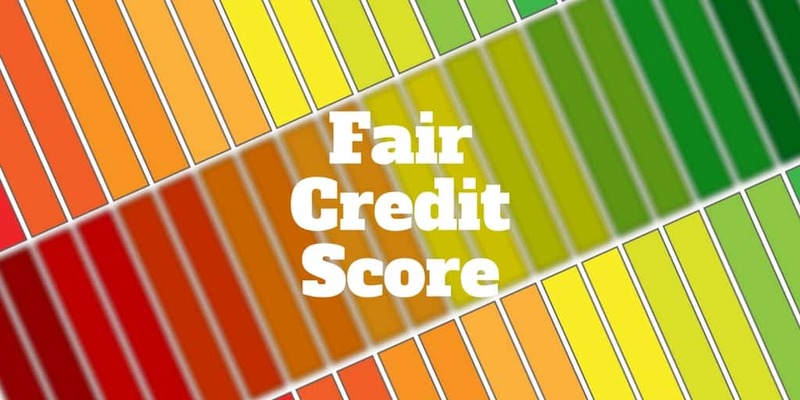 But what is a fair credit score and what is a good or bad FICO® Score? We break down estimated FICO® Score ranges so you can figure out whether, in the eyes of lenders, you have fair credit, good credit, excellent credit, or bad credit. How To Get Credit Approval With Fair Credit? 90% of top lenders use FICO® Scores, so it is well worth knowing what your credit score is by checking it with MyFICO. FICO® Scores generally range from 300 to 850 however some industry specific (auto and credit card) FICO® Scores range from 250 → 900. But what is a fair credit score? In the table below we correlate FICO® Scores with credit categories according to MyFICO. An 800+ credit score is excellent and way above the national average. Only about 1% of borrowers with credit scores of 800 and above typically become delinquent on loans. If you have a credit score between 740 and 799, you sit well above the national average. Most likely, you will not run into any issues getting credit approval and you will likely be offered lower than average interest rates to reflect your lower risk rating. According to MyFICO®, only about 2% of borrowers who have credit scores in this range become delinquent. Borrowers with credit scores in the range between 670 and 739 may or may not get an interest rate that rivals the rates received by borrowers with higher scores. Lenders usually consider credit scores in this range to be so-so or medium because about 8% of borrowers who have scores in this range become delinquent. What is a fair credit score? A borrower with a credit score in the range between 580 to 669 is considered to have a fair credit score. It is harder to get approved for credit when you fall into this category and the chances are you will end up paying a higher interest rate if you do. The reason for the steeper rates is because about 28% of consumers who fall into this category end up becoming delinquent. Bad credit or poor credit refers to scores of 579 and lower. It’s very difficult to get approved for credit when you fall into this category because about 61% of consumers in this category become delinquent. If you need to build your credit and improve your FICO® Score, follow these steps. The first step is to check your credit report to make sure it doesn’t contain any errors. If you spot any late bill payments or incorrect account information, you can dispute them with any of the credit bureaus, such as Experian, Equifax, and TransUnion. When your pay your bills on time, the credit bureaus report your timely payments to FICO and, over time, your credit score should increase in value. To ensure you don’t forget to pay off your balances, set calendar reminders to pay your bills on time or create an automatic payment schedule . Whether you have student debt, personal debt, or a credit card balance that has carried over from one month to the next, it is imperative to pay off your debt to improve your credit score. Create a payment plan to schedule bill payments regularly and make sure that you are paying off high interest rate credit cards and keeping up with minimum payments on any other accounts. If you have fair credit or bad credit, you may be wondering how to get approved for credit. To boost your chances, the first best step is stop credit card balances piling up. One way to do that is to choose a 0% balance transfer card which provides a grace period during which time you don’t have to pay high interest rates for a fixed time. Keep in mind that you may pay fees when transferring your balance from one credit card to another that has an introductory 0% interest rate offer. Did you know that when you pay rent on time, it often doesn’t help your credit score because many landlords don’t report timely rental payments. Companies like Rental Kharma and RentTrack help you to build your credit when you make rent payments when they are due. It’s an easy to way to build your credit without relying on a credit card or taking out a loan. Not all lenders rely solely on credit scores to make lending decisions. New American Funding earns high marks from customers for paying close attention to other factors when loaning out money. You can also use a company like LendKey to find local lenders who may or may not look beyond credit scores when making loan decisions. Whether you are looking for personal loans from companies like One Main Financial or SoFi, or auto loans from lenders like Finova, remember that you can interview lenders as much as they can interview you. As long as you don’t have a record of bankruptcy in the recent past or a history of delinquencies on bill payments, you will likely find a lending partner who is a good match for you. Do you know what a fair credit score range gets you when it comes to credit cards, mortgages, personal loans, and student loans? Share your stories about how to improve credit score ratings. We would love to hear from you in the comments below. >> CD Calculator: How Much Can You Earn?